Time for this week's CASology Cue Card. Halloween is only two weeks away? To create my card I embossed the sentiment in white on a little black stitched square mat. I stamped the candy corn on white, coloured them with Copics and then fussy cut before ahered them to the sides of the mat. Thanksgiving was wonderful this past weekend. A bit crazier than normal but lovely. My daughter was not able to get Sunday off of work and in good conscience did not want to phone in sick. Her big brother said he would stay back with her. So my husband and I headed to the cottage Saturday night without the kids so that I could give my Mom a hand with food preparations and my hubby could help my Dad with getting the cottage ready to close for the season. Sunday when Brooklyn finished work, she and Ben drove up to the cottage in just enough time to head to my brother's cottage for our Thanksgiving dinner. I think the kids had a great time together and I love how well they get along! 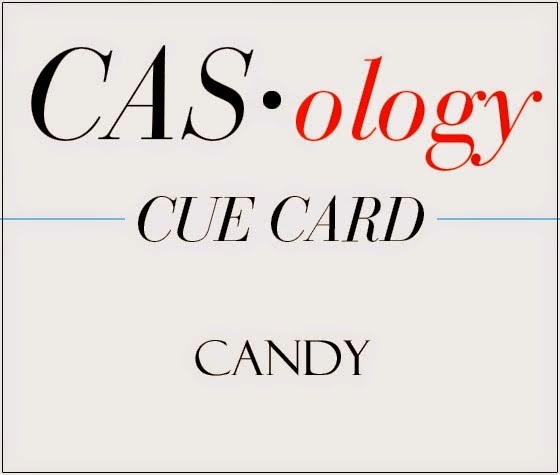 Head on over to CASology today to learn what the 'cue card' means to you, how you can play along and see the all the cards created by the Design Team to inspire you. I can't wait to see what you do! I love the candy corns. My favorite Halloween candy. Your thanksgiving sounds like it was a wonderful time. And how fun when siblings like each other and get along. Glad you had a good family time this weekend! I love these little candy corns...I almost used this set for my CQC this week! So fun to see it used this way, I would not have thought to emboss the letters in white on black, but it's perfect! Love the boldness of this - great use of pops of colour on this simple card! Isn't it nice when your children are nice to each other?! Mine are getting there....sort of! Love the Copic colouring on this card and your white embossing is so perfect! This is stinkin' sweet, Tracey! Love the embossing...it looks terrific on your CAS card! So glad to hear your Thanksgiving was wonderful, and that you had some 'family bonding' time. Your card is ultra adorable, and yes, I'll inevitably end up casing it because this little LF set is the only candy stamp I own (and only LF, at the moment). Super sweet; super cute! Happy Thanksgiving. This card is perfectly cute. Love those smiling candy corns and your black square panel. Flawless embossing, too. So happy that you were all together Tracey. Love the sweet candy corn. Love them! Totally cute. So glad everything worked out for the dinner and all were able to attend. Love it when siblings are good friends :) I'm that way with my brother and thankful my kids are good buddies. Sounds like everything went just as it should for your Thanksgiving, Tracey. Your children getting along is a wonderful thing to be thankful for =] Darling, darling card! Adorable candy card Tracey! Glad you had a nice Thanksgiving, the cabin sounds like a bit of heaven to me. Well shucks Tracey this card is too darn cute!! Sounds like a wonderful weekend!! Our Joe is an only child, but he has a wonderful relationship like your kids do with my brother's two girls!! I love seeing the three of them together! If you weren't on the DT I'd tell you this is total WINNER!!! Love this - perfect Tracey! I love this CAS design, Tracey! 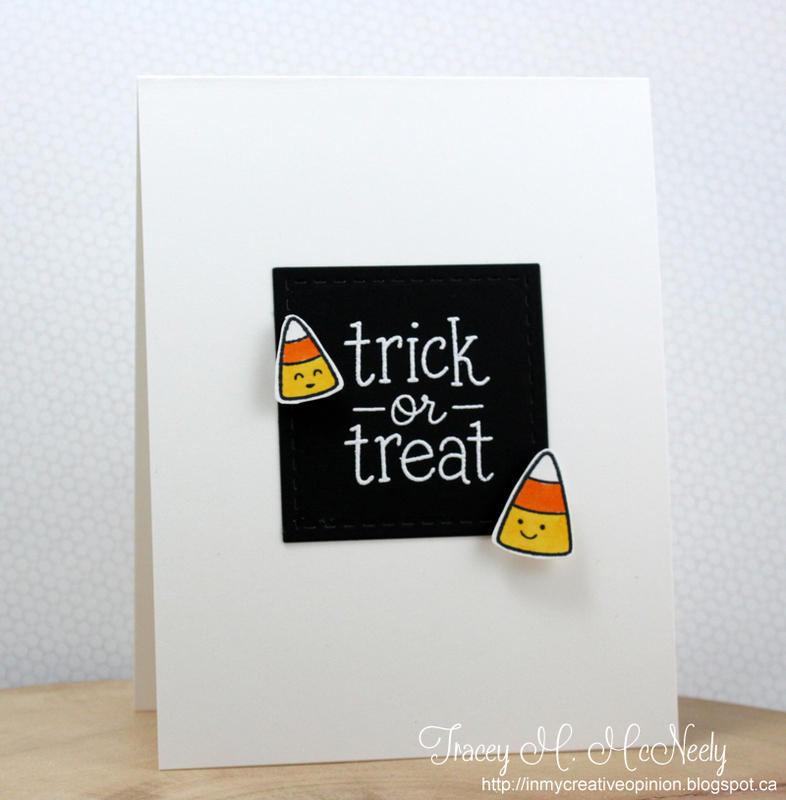 The candy corn is so fun, and I love how the black sentiment panel pops against the colors! Thank you so much for stopping by my blog...you are so sweet to consider sending money when you thought I needed help...Thank you! Soooooo cute! LOVING the candy corn!!!!! So glad to hear you had a lovely Thanksgiving with your family...can't beat those times! 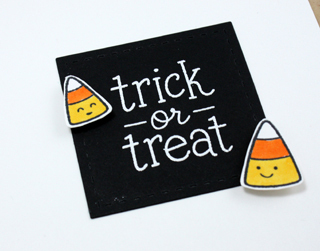 I love your simple, classic Halloween card...adorable candy corn images! Just too CUTE! Love those smiley candy corn faces! Cutest card ever! Love those sweet candy corn's with the sweet faces! Geometric Tree & A Very Trendy Holiday Giveaway! A Very Trendy Holiday 2.0 and a Giveaway!